New Argonne invention could advance technologies from golf carts to wind turbines. A new magnet technology invented at the U.S. Department of Energy’s (DOE) Argonne National Laboratory could help drive the nation’s transition from gas-powered vehicles to electric and hybrid power more rapidly, at lower cost and in a more environmentally friendly way. Called HyMag, the invention can benefit virtually any technology that draws power from electric motors or generates power from generators. The former includes battery-powered equipment and devices, such as power tools, wheelchairs, golf carts and electric and hybrid vehicles. The latter includes standby power for business and offshore wind turbines. When designed properly, the gain in the magnet’s usable flux density ranges from 10 to 30 percent, depending on the application and working temperatures, said HyMag’s inventors, Argonne’s Kaizhong Gao and Yuepeng Zhang. “This additional efficiency will translate into either more energy produced or you will have less loss,” said Gao, group leader of Nanomaterials, Devices, and Systems at Argonne. HyMag could especially benefit a weight-sensitive application, such as wind turbines, because the technology’s higher efficiency could lead to downsized structures. Stronger magnets would, for example, make it possible to reduce the amount of weight-bearing and support materials of the outer casings that sit atop direct-drive wind turbines. The outer casings account for more than half the weight of a 100- to 130-ton wind tower. Smaller casings could be designed into taller towers, allowing the turbines to access stronger winds. But even without an optimized design, a six-megawatt wind turbine that runs half the time during the year could generate three gigawatts more power with a 10 percent efficiency increase of its generator, according to Gao and Zhang. “This will reduce the energy cost of a wind farm and attract more wind power buyers,” Gao said. HyMag has received a 2018 R&D 100 award for its innovative solution to increasing usable magnetic flux density. Sponsored by R&D Magazine, the awards recognize the 100 most innovative technologies of the last year. 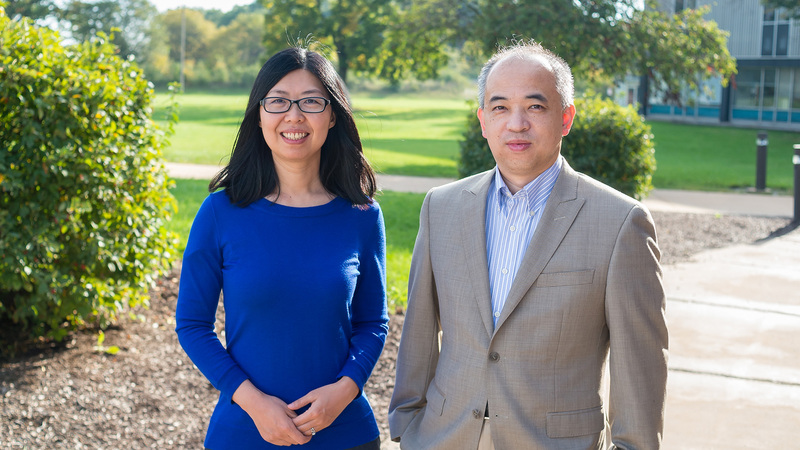 Conventional permanent magnets composed of neodymium, iron and boron became industrially widespread in the 1990s, yet they have resisted significant efforts to improve their performance, said Zhang, an Argonne materials scientist. Permanent magnets are a class of magnets that retain their magnetization and flux lines after they have been magnetized, conceptually similar to a battery holding electrical charges. “In the past 15 to 20 years, the increase in magnet energy product reached a plateau due to lack of material solution,” Zhang said. Researchers have looked into various ways to improve the composition, microstructures and processes of existing magnetic materials. Each could lead to a small improvement of the magnet’s energy product. On the other hand, the magnetic flux of a magnet decays rapidly with distance, which makes the use of magnetic flux insufficient. Gao and Zhang have improved permanent magnet performance by combining hybrid layers of material in particular way that reduces the flux leakage. Further, they can adapt their invention to specific challenges the private sector may have. In electric cars, for example, the maximum allowable temperature of a motor would be around 150 degrees Celsius (302 degrees Fahrenheit). But for wind turbines, the peak temperature can be up to 300 degrees Celsius (572 degrees Fahrenheit), which calls for a magnet design that is more robust (not demagnetized) at higher temperatures. “There are materials that actually have better performance at higher temperatures,” Zhang said. Another appealing feature of HyMag technology is that for certain applications it may compositionally require up to 90 percent less heavy rare-earth elements, such as dysprosium and gadolinium, by weight, than the regular magnets that have similar performance. These elements, mostly imported from China, are scarce, expensive and difficult to recycle. But the motors in electric and hybrid cars contain approximately a tenth of a kilogram of dysprosium per motor. Industry representatives interested in collaborating with Argonne in further developing this technology for specific applications, or to inquire about licensing, may contact partners@​anl.​gov. The Department of Energy’s Wind Energy Technology and Advanced Manufacturing offices have provided support for the development of Argonne’s HyMag technology.